The bobcat may not be taken in Maryland. A hunting license and furbearer permit are not required to hunt nutria and woodchucks except in Baltimore County, where a hunting license is required to hunt woodchucks. 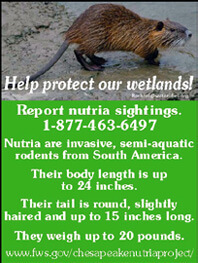 Nutria and woodchucks may be hunted throughout the year, including Sundays. Hunters must wear daylight fluorescent color clothing while hunting woodchucks. All hunting devices legal for other game animals may be used to hunt nutria and woodchucks. Daily furbearer shooting hours are one half hour before sunrise to one half hour after sunset (unless otherwise specified). Written permission is required to hunt or trap on private land. A hunting license is required to hunt or trap furbearers (with exceptions). See Hunting Licenses and Prices or Armed Forces information and hunting license costs, exceptions, purchasing, requirements and types. A Nonresident Hunting License and Nonresident Trapping License are required of nonresidents to trap furbearers in Maryland (see Other Licenses, Hunting Licenses). A Furbearer Permit is required to hunt, chase or trap any furbearer in Maryland (see Furbearer Permit and Exceptions, Furbearer Hunting & Trapping). Destroying or disturbing furbearer dens is prohibited. A permit is required to possess the meat or skinned carcass of a furbearer for more than 10 days after the season has closed. Permits can be obtained from the Natural Resources Police (see Addresses & Phone Numbers). The pelt or unskinned carcasses of all fisher and river otter harvested must be tagged within 15 days after the season has closed. Fisher and otter pelt tags may be obtained by contacting local offices of either the Wildlife and Heritage Service or Natural Resources Police (Addresses & Phone Numbers). Trappers are required to submit the whole, skinned carcass of any river otter harvested in Allegany and Garrett counties to the Wildlife and Heritage Service. Call 301-334-4255, Mt. Nebo Wildlife Management Area. The pelts or unskinned carcasses of furbearers harvested in Maryland that are transported across the state line must have a “Fur Shipping Tag” accompanying them. These tags are available through the COMPASS portal at compass.dnr.maryland.gov or by contacting local offices of either the Wildlife and Heritage Service or Natural Resources Police. On those lands owned or controlled by Department of Natural Resources in Caroline, Dorchester, Somerset, Talbot, Wicomico and Worcester counties; only leaseholders or their appointees can hunt or trap furbearers and nutria between Nov. 15 and March 15. In Charles and Dorchester counties, a person may hunt and trap fox or possess the pelt of a fox any time of the year. It is unlawful to kill a fox being pursued by dogs in Cecil, Harford, Kent and Wicomico counties. It is unlawful to hunt, trap or shoot at wildlife within 150 yards of any building or camp occupied by human beings without permission of the owner or occupant. For archery hunters this distance is 100 yards in Anne Arundel County and 50 yards in Carroll, Calvert, Frederick, Harford, Montgomery and St. Mary’s counties. In Harford, archers must use a tree stand when hunting between 50 and 100 yards of any building or camp occupied by human beings. In Montgomery, archers must be in an elevated position when hunting between 50 and 100 yards of any building or camp occupied by human beings. Daylight fluorescent color clothing is not required to hunt or trap furbearers. Hunting furbearers on Sunday is prohibited except for nutria and in Allegany, Garrett and Washington counties (see Furbearer Seasons, Bag Limits, Locations and Resident Requirements, Furbearer Seasons & Limits). A Furbearer Permit is required to hunt, chase or trap any furbearer. A Furbearer Permit is required of persons participating in the unarmed chasing of fox and raccoons and it is required of those Who May Hunt Without a License (Hunting Licenses) to hunt, chase or trap any furbearer. Any person can purchase the Individual Furbearer Permit. A representative of an association or group that chases or hunts furbearers may obtain the Group Furbearer Permit. Members or guests of an association or group with a Group Furbearer Permit are not required to have an Individual Furbearer Permit. A Group Furbearer Permit holder must submit a report to the Department of Natural Resources by September 1 following the end of each permit year. A person who possesses a Wildlife Control Cooperator Permit and is engaging in the control of fur-bearing mammals in accordance with the terms and conditions of the permit. A landowner who possesses a Landowner Wildlife Damage Control Permit. A person who possesses an Apprentice Hunting License. A landowner to destroy a muskrat that is damaging an embankment or impoundment. A landowner to hunt or trap a coyote, fox or skunk that is damaging or destroying the personal or real property of the landowner on their land. The owner of a marsh or the owner’s employees to hunt any raccoon which destroys a muskrat or its home in a marsh area within the state. A landowner or the landowner’s agent to set or use traps or similar devices at any time to trap raccoons or opossums which are damaging property. Any person who traps or attempts to trap furbearers under the authority of a Furbearer Permit must first obtain a Certificate of Trapper Education from the Department of Natural Resources (or a designee of the department). The Certificate is not required if the person possesses an apprentice hunting license or held a Furbearer Permit prior to August 1, 2007. Any similar certificate issued by another state is acceptable as complying with the educational requirements if the privileges are reciprocal for Maryland residents. All trappers are encouraged to participate in a trapper education course. These courses are held statewide. Firearms, archery equipment and air guns may be used to hunt coyote, fisher, gray fox, nutria, opossum, raccoon, red fox and skunk. A hunter pursuing these furbearers must possess a valid Furbearer Permit. It is illegal to shoot a beaver, long-tailed weasel, mink, muskrat or river otter. An unarmed person participating in an organized fox chase may chase foxes on Sundays. Fox hunting with the aid of dogs is prohibited during the deer Firearms Season with the exception of unarmed fox chasing. Daytime and nighttime hunting for foxes is permitted during the legal harvest season for foxes. Coyotes can be hunted at night during the specified season. At all other times of the year, coyotes may only be hunted during daylight hours (one half hour before sunrise to one half hour after sunset). Raccoons that are destroying muskrats and/or their dens may be hunted any time of the year by owners of the affected marshlands or their employees. Legal hunting season hours for opossums and raccoons are at night, from sunset to sunrise. The use of artificial light and/or dogs is permitted while hunting coyotes, foxes, opossums or raccoons on foot. Coyotes, fishers, foxes, opossums, raccoons and skunks can be hunted with the aid of electronic calling devices. Telescopic and laser sights may be used on all devices legal for hunting furbearers. It is illegal to hunt or shoot at wildlife within 150 yards of a any building or camp occupied by human beings without permission of the owner or occupant. For archery hunters this distance is 100 yards in Anne Arundel County and 50 yards in Carroll, Calvert, Frederick, Harford, Montgomery and St. Mary’s counties. In Harford, archers must use a tree stand when hunting between 50 and 100 yards of any building or camp occupied by human beings. In Montgomery, archers must be in an elevated position when hunting between 50 and 100 yards of any building or camp occupied by human beings. A shotgun may not hold more than three shells in the magazine and chamber combined. Rifles and handguns may be used. Full metal-jacketed, incendiary, or tracer bullets may not be used. Muzzleloading rifles, shotguns and handguns may be used. To be considered a muzzleloader, a rifle, shotgun or handgun must be loaded from the muzzle, and a revolver must be loaded from the front of the cylinder. Muzzleloaders are considered unloaded if the ignition system is disabled by removal of the cap, primer, battery or primer powder. It is illegal to have a loaded firearm in, on or leaning against any vehicle. This includes ammunition in the magazine or a muzzleloader ready to fire. Vertical bows may be used. Draw locking devices and release aids are legal for hunting these furbearers. Crossbows may be used. All crossbows should have a working safety. The use of poisoned or explosive tipped arrows or bolts is not permitted. It is illegal to have a loaded crossbow in, on or leaning against a vehicle. Air guns that shoot bolts, bullets, or arrows may be used to take coyote, fisher, gray fox, nutria, opossum, raccoon, red fox and skunk. It is unlawful to have a loaded air gun in, on or leaning against a vehicle. An air gun with the projectile removed is considered to be unloaded. Unarmed fox chasing is not included in the statutory definition of hunting. However, it is subject to Department of Natural Resources regulations. Individuals participating in the unarmed chasing of fox must possess an Individual Furbearer Permit or be a part of an organized group that possesses a Group Furbearer Permit. Additional permits may also be required to chase foxes on certain public lands. All activities on Department of Natural Resources owned and managed properties are subject to the department public land regulations. It is unlawful to tamper with and remove the catch from any legally set trap. All individuals who trap furbearers must possess a Furbearer Permit (Furbearer Hunting & Trapping) unless exempt from the requirement. Written permission is required to trap or hunt on another person’s property, including publicly owned properties. These traps can be used on state, federal or private wetlands. These traps can be used on lands that qualify for agricultural assessment, timberlands and lands used for reforestation. Body-gripping traps with a diameter of less than six (6) inches can be used when completely submerged in water. In Harford and Howard counties: landowners and lessees of privately-owned land may use these traps on their property as long as they are not within 150 yards of another person’s permanent residence. Traps must be checked once per calendar day except those traps that are set in water or tidal marshes which must be checked once per two days. In tidal areas, landowners and their agents or lessees have exclusive rights to muskrats and other furbearers above the mean low water line. Any furbearer caught during the legal trapping season for that species may be released on site, but may not be transported from the point of capture unless it has been killed. Animals caught during the closed season for that species must be released on site. Body-gripping traps with a diameter of greater than eight inches can be set when partially or totally submerged in water. Body-gripping traps with a diameter of eight inches or less can be set above ground in bogs, flooded non-tidal wetlands, fresh water marshes, tidal wetlands, wooded swamps, in areas where water covers the surface of the soil or in areas where the soil is waterlogged to the surface. In all other areas these traps may be set when partially or totally submerged in water. The use of toothed or serrated jawed traps is prohibited. All traps must possess smooth jaws. Traps can be set above the waterline on farmland by the owner(s) of the property, members of owner(s) immediate family that reside on the property and the landowner(s) agent, tenant or lessee. Traps can be set above the waterline in response to wildlife control concerns by authorized agents of the Department of Natural Resources, and according to guidelines established by the department. It is illegal to use, sell, possess, set, place or maintain a snare trap in Anne Arundel, Baltimore, Carroll, Cecil, Harford, Montgomery and Prince George’s counties.